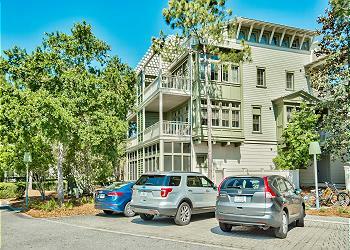 - Located on the south side of 30A, steps from the beach. DETAILS: Enjoy your family beach vacation when you stay at 1640 E County Highway 30A unit 101. This 2 bedroom, beach condo is nestled on the south side of 30A in the Gulf district of WaterColor. Sip your morning coffee on one of the units two porches while enjoying the Florida weather. Guests will enjoy this units close proximity to the WaterColor Beach Club, Gulf of Mexico, and the many shop and boutiques located in the community. Check availability and book today! **Beach Club Construction Update - We are excited to announce the Beach Club in WaterColor will be expanding to offer two additional pools, a restaurant with indoor and outdoor seating, a bar area and much more! Tuesday after Labor Day (9/4/2018), the Beach Club will close, resulting in zero access to the Camp or Beach Club pools through the end of the year. During the construction process, access to the beach, rental chairs, towel service, and alternative food service and restroom options will still be available. The expected completion date for phase 1 of the Beach Club is Memorial Day, 2019. During construction, the HOA is working to ensure all alternative WaterColor community pools are heated. .
Watercolors was great! The condo was outstanding. We will definitely be back in the future. We are so happy you and your family had such a great time in Watercolor and enjoyed the condo! Thank you for staying with 360 Blue and we can't wait to have you back again soon! Overall, place was great. Location is perfect. We would definitely recommend. Only a couple critical comments. Internet/ Wifi is terrible. Staff came to “fix” once but continued to be a problem. Lastly, service knocks at the door 8am on checkout day.....to paint bathroom ceiling. You’re kidding right? You have from 10 til 4 prior to next guest. Do it then. We are glad you enjoyed the location of this condo for your stay with us in Watercolor! We do apologize for the wifi issues during your stay, we do show that we had to get the cable company involved but we have since corrected the issue. We are also very sorry for the painting crew stopping by as you all were trying to pack up to check out. Normally, we get a heads up that they want to come by but we did not get an update in this case. We will be sure to share this with our team to ensure this does not happen again! Thank you for staying with 360 Blue, we hope to see you again soon! We are so glad you enjoyed your stay! Thank you for staying with 360 Blue! Fabulous! My family loves this place! We had a wonderful vacation. Thank you! We are so glad that you and your family enjoyed your vacation with us in Watercolor! 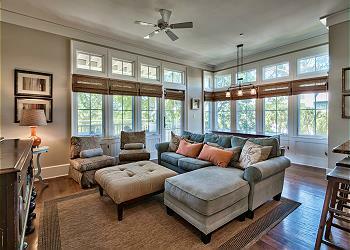 We agree that this condo is a wonderful option for a fun getaway! We look forward to seeing you all again soon! My family and I had a wonderful vacation in watercolor my teenage daughters utilize the bikes to get seaside everyday very convenient to everything! We were missing a couple things like extra towels and broom and dust pan but contacted 360 and within a couple hours we had it! Everyone was polite and very helpful and we were appreciative of their promptness and service. Very please with 360 blue! Thanks!! Looks like the perfect day to relax and unwind at the beach! We are so happy you had such a wonderful stay! Thank you for choosing to stay with 360 Blue and we hope to have you back on 30A again soon! Great location! Great condo! Had everything we needed and more! What a beautiful family photo! We are so happy you had such a great stay in WaterColor. Thank you so much for staying with 360 Blue and be sure to come back and see us again soon! What a beautiful photo! We couldn't be more happier that you and your beautiful family had such a wonderful stay in WaterColor! Thank you so much for staying with 360 Blue and we can't wait to have you back at the beach again soon!